While I’ve only been blogging about my Lending Club returns so far, I also have a Prosper account. 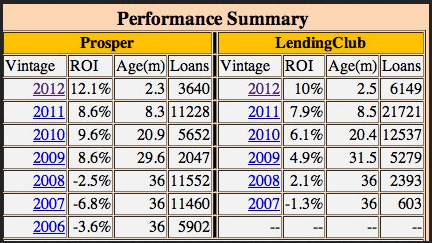 I’ve actually been a lender with Prosper longer than Lending Club, almost 2.5 years now. I’ve been a lender with Lending Club for almost 2 years. You would think that by now, I’d be able to choose a favorite. However, I cannot. They both have features that I like. Prosper has instant fund transfers, Quick Invest and a robust API. I seem to have less late loans on Lending Club and the company is doing better financially. I’ve decided to do a little experiment to sort things out. This morning, I transferred money into my Prosper account so that it has the same amount of money as Lending Club. I also recorded all my interest and defaults in the handy little table you see below. From this point on, I’ll not only be closely watching my returns with both platforms, but also paying close attention to how they do against each other. I’ll use a combination of Lend Academy’s Super Simple Strategy and also this one. I’m using both because sometimes there aren’t any loans available for a particular filter. I’m using the Quick Invest feature on Prosper. This means that loans are automatically purchased for me based on my preconfigured filters. I don’t have to intervene at all. This is both scary and exciting. Since Lending Club doesn’t have a feature similar to Quick Invest, I’ll login every morning at 6am (PST) when most loans are released. Since loans are being quickly bought up, this will give me the best chance of getting the loans I want. To make the contest fair, I’ll add money in equal amounts. If I add $100 to Prosper, Lending Club will get $100 too. 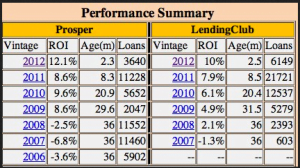 In reality, I admit that the Prosper verses Lending Club question may never really be answered. The industry is young and both companies are evolving rapidly. As both platforms evolve, my strategies will also evolve. Also, due to the the small size of my accounts, just a couple of unlucky defaults could skew the contest. The results would be a bit more accurate if I had at least $10,000 in both accounts. However, this is a goal I’m working towards, so things should even out over time. I plan to provide an update about every month, so stay tuned! Great simple breakdown. Thanks so much for this. Great post! I completely agree with you about having to login every day at 6am. Bleh. Now, Lending Club does have automated options, but only for their IRAs. Supposedly, they are working on an automated solution for all types of accounts. If there is any consolation, its that it only takes about 5 minutes each day after you have everything configured. I do recommend you give the P2Ps some consideration though. I like them very much, especially in the current environment of horrible interest rates on savings accounts. If we ever get back to the good old days where Internet banks are paying 5%, I would definitely throw more money in that direction. I’m not sure about Prosper, but Lending Club is supposed to be in every state by the end of 2014 at the latest. Keep a watch on it! Awesome! This will be a fun project to track! My one concern is that it won’t necessarily be exactly apples to apples for the comparative nature of this project. With both companies have proprietary underwriting models and your investment criteria being somewhat flexible, and subject to change over time, this might skew the results. But regardless of all that, I am very bullish on peer-to-peer lending as you know, and think your experiment will result in success in both accounts. Good luck! Yeah, its definitely not an apples to apples comparison. As you say, there are too many differences between the sites. However, the Interest Rate is one number we all can understand. I’m really curious to see if one wil significantly outperform the other. I’m really enjoying your site. Great content. I’m looking forward to your updates on this one. I’ve become increasingly interested in trying one of these lending experiments myself! I fully encourage the experiment! I’ve had great experiences with both Prosper and LendingClub and plan on putting large amounts of money in both in the near future. The way I look at it, I can make 10% P2P lending or .5% in a savings account. Glad you’re here and thanks for the comments! I’ve just reached $10,000 on LC and I’m beginning to build toward $10,000 in Prosper to do my own comparison. Also, the Lend Academy link was valuable. Thanks! I love P2P lending. It almost seems too good to be true. Where else can you earn 10% consistently and I believe, safely. Even if my returns dropped in half, I’d still be doing far better than any savings account or CD. In a search for higher yields without the assumption of outsize risk, I started investing in both prosper.cm and lendingclub.com last summer. I started my career as a direct and indirect instalment lender and thus felt that I might have a leg up in terms of underwriting experience. Of my 209 prosper notes, 21 have been repaid, 1 is delinquent and the remaining 184 are current. I have $14,000 invested showing a current yield of 7.72%. All the notes are AA or A rated with the exception of one B. Note sizes range from $50 to $500. Of my 487 LC notes, 38 have been repaid, 1 has been charged off, 4 are 31-120 days overdue, 1 is 16-30 days overdue with the remaining 443 showing as current. I have $19,000 invested showing a current yield of 5.60%. No loan is less than A rated, and I have tight underwriting contraints. Collection efforts appear to be underwhelming. For the time being, I am suspending further note investment until I get a better sense of what constitutes a top rated note and the extent to which the institutional lenders receive may preference or not. Both sites appear to have moved to showing the institutional lenders whole loan purchase information on a basis which they indicate is randomnly chosen as to credit quality and loan size. This information is shown to the institutions in advance of dissemination to the “peers”. I respect the fact that this is business and both sites have to make hard decisions regarding the profitability of their customers. It’s far more profitable to make a single loan from 1 entity rather than a single loan from 200 people. My more recent experience with both sites indicates a seemingly lower level of credit quality and more higher dollar loans at the quality level in which I am interested. It thus takes more time to cut through the somewhat opaque information and reach a decision. The institutions seek to diversify their risk with more smaller loans and better quality credit. My personal preference ia a loan less than $10,000. I note that both sites indicate that their overall loan application volume is down. but not at the expense of being the patsy in the poker game. I think the P2P concept could have broad applicability to the commercial and industrial markets and could supplant marginally effective domestic commercial banks in the personal lending business. Today I took the leap of faith and invested my first $25 in Lending Club. I know it sounds silly but it’s my first investment I have ever made outside of the normal 401k, house, and savings accounts. I am looking forward to watching my account grow. But I am nervous about losing to defaults and investing in higher risk loans as well. I am sure the more experience I get I will learn to have more tolerance for the ups and downs. I plan on investing the $25 at a time, focusing on A rated loans that have low payments and lower loan amounts. I might do an A rated loan versus a B rated or higher risk just for fun and to keep my competative spirit going, even if its just against myself. Do be careful! One of the keys to succeeding in peer lending is diversification. Successful lenders spread their risk by purchasing a lot of loans. I’d say that 100 is a good place to start. Defaults will happen and the first one will feel terrible. However, they are just something that you’ll get used to. Keep your eye on the big picture. I started out like you, very conservative and gradually worked my way into riskier notes. So far, it hasn’t made a lot of difference. Great story. I’m new to p2p lending and primarily working with Prosper as both a borrower and lender. The bulletin board, bb.p2prant.com is up just to share my experience as I move forward. I’m 32 loans into my goal of 100-400 in my investment scope. Only a month in I’ve got a few lessons learned with two borrowers already late–one never got the first payment on the books. Goal of the board is to get other perspectives too, so feel free to post on my experiences. Again, great article and very useful info to me prior to getting started with p2p lending!